I'm not sure how I missed this, but someone emailed me a link about The Wee Free Men being adapted into a movie. My first thoughts were, "Oh Gawd! Someone's going to ruin another beloved book series!" My second thoughts were, "Why would I think that, some of the great Terry Pratchett's adaptations weren't that bad, and this could be good..."
Then my third thoughts cut in with, "Whoa, whoa, WHOA!!! The reason I think that I thought that was because the adaptations of the great Terry Pratchett's books that were bad scare people away from the aforementioned books, and that is a bad thing to think." And then there were my fourth thoughts, since they were the thoughts you think about the way you think about the way you think about the way you think, they led me into a grand confusion and then I walked right into a door. Together they must face headless horsemen, ferocious grimhounds, terrifying dreams come true, and ultimately the sinister Queen of the Elves herself. . .
Really, this could actually turn out to be a wonderful thing. Each new Pratchett adaption gets better. I really enjoyed Going Postal, and my only real complaint was that the Golems looked preposterous. After reading the article from The Mary Sue link, I see it is Terry Pratchett's daughter Rhianna Pratchett doing the honors of transforming the book into something filmable. Being quite the video gamer gave me a bit of experience with some of her work such as Mirror's Edge, Heavenly Sword, and most recently the newest Tomb Raider game. All of them are well done and don't give me a sour worried taste in my mouth. And besides, she has direct access to the author's thoughts and opinions whenever she wants. This also reminds me, what ever happened to The Watch? The adaptation of the City Watch stories with good old Commander Sam Vimes heading up the team of oddball police officers. I heard it was going to be along the lines of CSI: Ankh-Morpork- with all the Pratchett brand of humor they could throw in. Well, here is where my worries do begin- if they make it, will it be live action or will it take the 3D animation route like How to Train Your Dragon? Because the army of 6 inch hilarity called the Nac Mac Feegles, which can only be described as simple minded, highly aggressive, semi-drunken Gaelic Smurfs, need to be done in a way that lasts and would be memorable for both adults and kids. 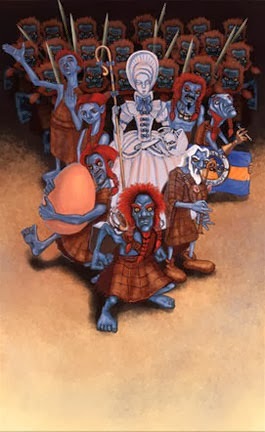 As for the cast- there is only one character I can think of that I'm reasonably certain everyone else also pictures in their heads as well- Granny Weatherwax. Who else could play the role as perfectly as Maggie Smith? She practically lives the role in real life anyways. I truly hope this gets done well. The Discworld series, and the Tiffany Aching stories, deserve the best treatment possible. If done right this could be on par with the long Harry Potter series. So if The Wee Free Men does well, would we expect more of young miss Aching's witchy ways with A Hat Full of Sky, Wintersmith, and I Shall Wear Midnight? I can only hope so.